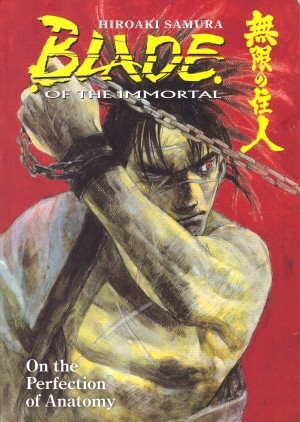 It’s a measure of how confident a storyteller Hiroaki Samura has become, and of the compelling nature of the cast that Manji, the immortal of the title, is barely seen, having only played a small role in the previous Autumn Frost. Despite this Mirror of the Soul is a standout volume in a masterful series. The focus is instead primarily on Anotsu Kagehisa, about whom audience perceptions have shifted greatly. When he and his Ittō-ryū swordsmen were introduced they appeared monstrous, and indeed indulged in monstrous acts, but the more he’s been seen, the more he’s been understood, and is now married. If anyone bears him a grudge, however, it’s Rin, whose young life has been defined by his murder of her parents, and who’s sworn revenge. The pair meet early in the book when she’s at her weakest and only Anotsu stops to help when she’s collapsed on the footpath. 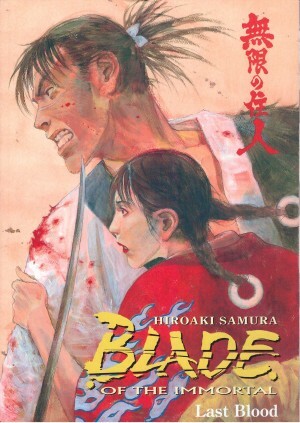 It’s a stunning dramatic moment, and, astonishingly, Samura manages to increase both the passion and the drama. Twinned Japanese concepts of honour and obligation are explored with Anotsu and Rin the only really familiar characters for most of the book. 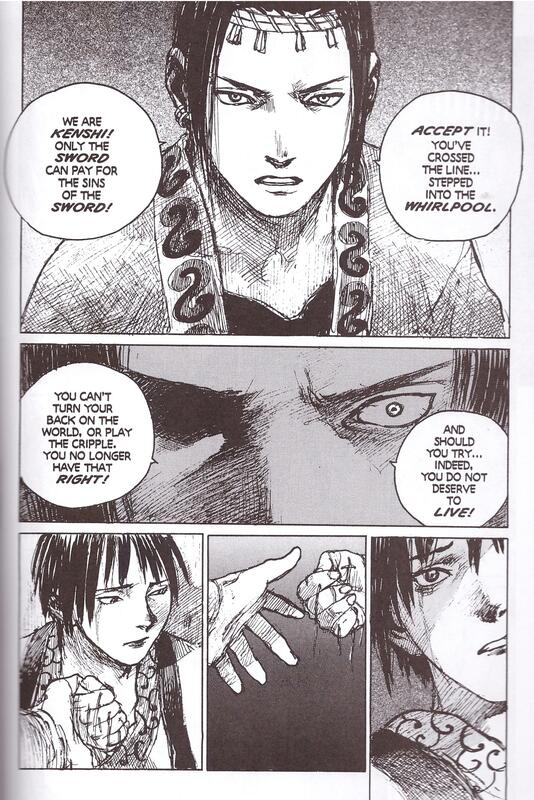 Anotsu learns the establishment considers the time has come to dispose of his organisation, Rin learns of Anotsu and from him, and the audience learns of Samura’s thoughts about the feudal systems of honour. Samura’s now built up a significant cast, and yet still surprises with the return of Makie, introduced early in Dreamsong and one of the most tragic characters in the series. 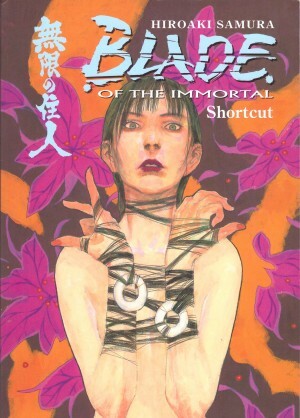 She’s among the best with a sword, good enough to defeat Manji, which few others have, yet views much of her life as a curse, and in the title sequence has now taken drastic steps in what’s possibly the book’s most horrific revelation. Samura’s twisting of motives and reflecting those of other characters is gut-wrenchingly superb. However, Samura’s not finished. 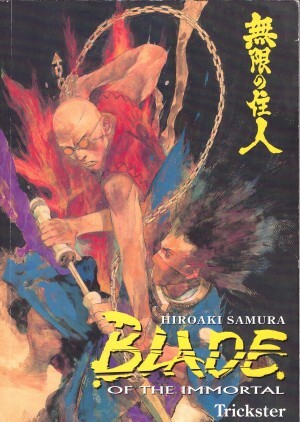 He has a pair of final twists to throw into the book, one a sneaky odds-evening proposition that again demonstrates the depths of consideration applied to Blade of the Immortal, the other excellently foreshadowed. This is undoubtedly a five star graphic novel, excellently written with real emotional weight and, as ever, stunningly drawn. As brilliant as it is, and very much a turning point in the series as a whole, some dramatic strength is lost if Mirror of the Soul is read in isolation. Most of Makie’s circumstances are explained, but the scenes with Rin and Anotsu alone really require experiencing what Rin has since the series began for the maximum emotional impact. 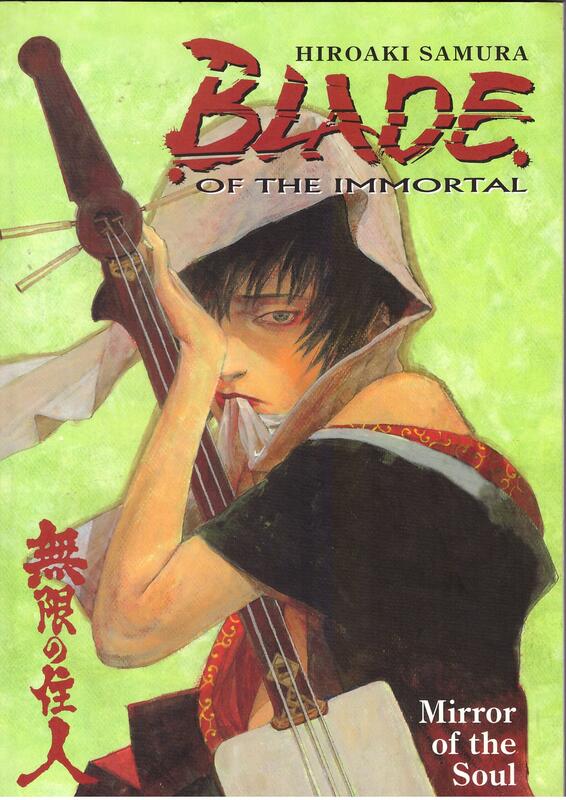 By the conclusion much has changed, and Manji’s back for the next volume, Last Blood.